Mumbai-based English-language daily The Indian Express has reported that the Nek Chand Foundation is willing to work with the Chandigarh Administration and the Rock Garden Society to help re-start work on the Rock Garden's unfinished phase three. Places in Nek Chand Foundation volunteer groups to the Rock Garden, Chandigarh are still available for one month stays in November/ December 2013 and March/April 2014. The October 12th to November 9th 2013 group is now full as is the February 15th to March 15th 2014 group. Several places remain open for the dates November 15th to December 13th 2013, as well as one or two for March 17th to April 14th 2014. The Nek Chand Foundation has increased the number of volunteer groups at the Rock Garden because of the number of applications it received this year. Read more about Volunteer Places Still Available! This is a unique opportunity to see Nek Chand's work in an exhibition setting in the UK. During their spring 2013 visit, Nek Chand Foundation volunteers Alan Ceserano and Jan Lewin began vital work on archiving materials in Nek Chand’s Rock Garden office. The cave-like chamber with its curved ceiling of pebbles set in concrete is home to a rich legacy of papers and objects related to Nek Chand’s creations and history. It is where Nek Chand has worked and received visitors – many bearing gifts – every day since 1978. Nek Chand and the Rock Garden are featured in the latest edition of Grout. 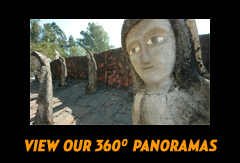 The article by John Maizels of Raw Vision and the Nek Chand Foundation, gives Nek Chand's history, describes the Rock Garden, provides information on the work of the Foundation and its volunteers, and includes many fine photographs. Grout is published by the British Association of Modern Mosaic.